Amapa, on the Amapa Grande River, was selected as the site for a naval air base to support the operation of two blimps and three patrol bombers. 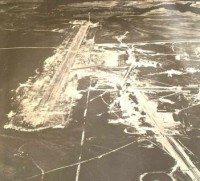 When naval construction was started on June 22, 1943, the Army had completed 3,000 feet of a proposed 5,000-foot runway, a grass runway about 5,000 feet long, and a portion of the accompanying permanent housing development. Construction for the Navy included housing and mess facilities for crews and maintenance personnel and a blimp take-off mat. All construction, both Army and Navy, was performed under the Airport Development Program. The base was fully utilized by lighter-than-air craft, but patrol bombers were based there only when the tactical situation required it. 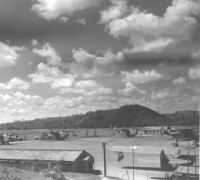 This base was established in early 1943 by the U. S. Army and was the most northern of the Brazilian airfields. NAF Amapa was established at the site on 26 November 1943. It shared a portion of the field with the USAAF and provided support for landplanes, generally the PB4Y-1 Liberator. VP-83 aircraft provided ASW coverage from this base for convoy routes between NAS Trinidad, British West Indies and Bahia, Brazil. NATS occasionally used the airfield as a refueling stop. NAF Amapa was disestablished on 30 June 1945 and returned to the Army. 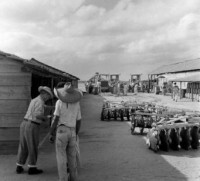 At the beginning of April 1943, NAF Amapa was practically built and ready to commence the operations. It was erected by a joint effort made by Panair do Brasil, a Pan Am subsidiary and United States Engineering Department (USED). Located deep into the Amazon jungle some 256 miles Northwest of Belem, it was the northwestern most of the bases established by US Navy along Brazilian coast. One single 4000 foot runway was built as well as some mooring masts for accommodation of LTA Navy Blimps, thus being necessary for the construction the opening of a clearway in that dense jungle for initial task of leveling the ground located on a swamped area. Barracks were raised for the accommodation of the pioneering garrison, including the control tower. As the time progressed, those facilities although completely isolated from any human contingent beyond the outskirts of that tiny military outpost, gradually became comfortable despite shortcomings such as the lack of any recreation facilities so necessary for those isolated men. The first squadron to operate in a regular basis was VP-94 with the versatile PBY-5A Catalinas stationed at Belem. It also had the concourse of one Blimp the ZPK-118, which rendered a relevant service of search and rescue aircrews of crashed planes in the forest. Hundreds of aircrafts flew across the region in increasing numbers from 1943 onwards. That particular airspace, between Belem and Georgetown with 760 mile extension, represented a constant headache for so many crews and salvage teams, where an engine failure, a navigational mishap or the ubiquitous thunderstorms poised as a perennial threat. One clear evidence of these concerns took place on 10/Feb/43, when 2 medium bombers B-25 Mitchells failed to return to Belem after a routine patrol sweep. With gas low in reserve, their crews elected for a forced landing, bringing the plane to stall over tree tops just before sunset. They managed to transmit their position which was picked up by the superbly efficient radio stations at Amapa and Belem. In the following day in the first lights of the morning, a salvage team with aircrafts from VP-94 based at Belem and Amapa, set for the crash site. Flying low with the propellers roughly clipping the tree tops, all eyes scanning the jungle until finally the smoke signal launched by the survivors was seen. Some of them suffered injuries but thanks to the magnificent job done by ZPK-118, the men were safely picked up. The valorous Blimp, in its attempt to hover lower on the tree tops had itself sustained some damage in its external fabric structure by the attrition with the shrubs. In this particular, the arrival of the blimps was of invaluable price, not only by their uncountable search and rescue missions over the closed jungle, but also over the ocean. 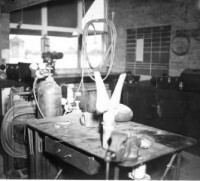 Those cumbersome crafts located and rescued 96 out of 125 survivors from the blockade runners sunk in south Atlantic by units of the Fourth Fleet. Remnants of the Amapa base are still present until today. US Blimps were used in a variety of missions ranging from search and rescue missions over the dense jungle to patrol over the Atlantic. One Blimp seen in this rare photo from Amapa Airfield late in 1943. A 26 Invader seen at right and one B 25 Mitchell parked at ramp Amapa. 50 years later the generators which provided power to the base are silent but intact. One of the various magazines stil preserved. Two guys play guitar to the audience so that they can forget the confinement in the dense jungle.